From July 10 to September 30, a team of NOAA and external partners both at-sea and on shore will conduct the Hohonu Moana: Exploring the Deep Waters off Hawai’i expedition. 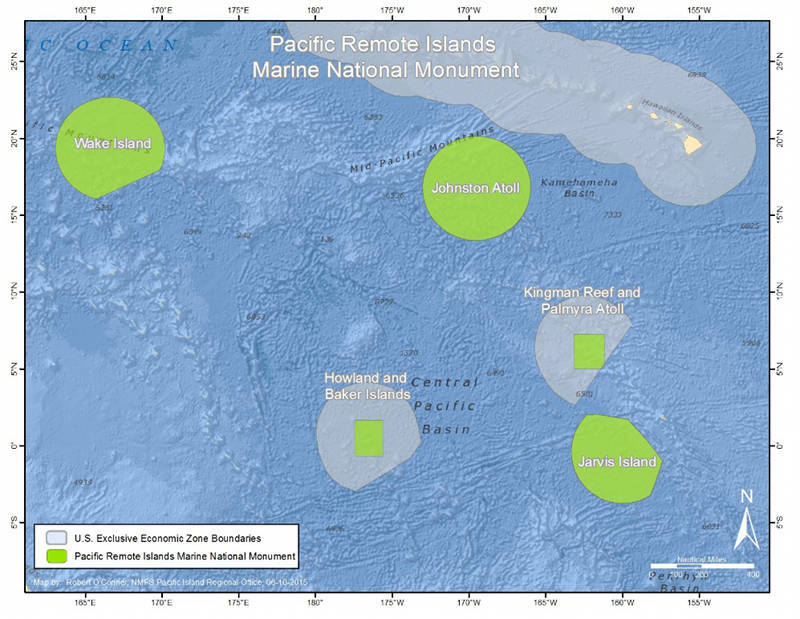 The 69-day expedition will include four cruise legs to conduct mapping and remotely operated vehicle (ROV) operations in the deep waters of the Hawaiian Archipelago, including the Papahānaumokuākea Marine National Monument (PMNM), and Johnston Atoll – part of the recently expanded Pacific Remote Islands Marine National Monument. 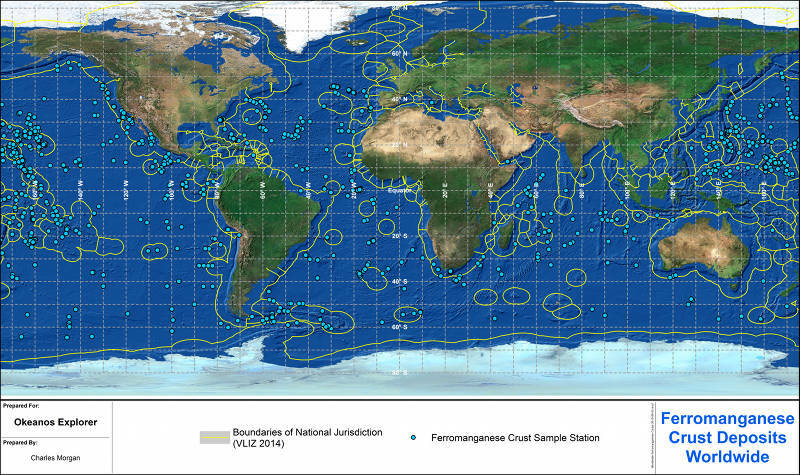 The primary Expedition goal is to acquire baseline information in deepwater areas to support science and management needs in and around the marine national monuments and national marine sanctuaries, including information relevant to emerging regional issues like the U.S. Extended Continental Shelf and deep-sea mining. In the coming months, we expect to explore several seamount groups, rift zone ridges, drowned reef terraces, pinnacles, deep-sea coral and sponge communities, manganese crust habitats, an enigmatic crater, a submarine canyon, and a sunken submarine. All of these exciting features are within the U.S. exclusive economic zone. ROV dives will include high-resolution visual surveys and limited sampling – including the first-ever look at deep seafloor habitats offshore of Johnston Atoll below 400 meters and habitats deeper than 2,000 meters in PMNM. We never know exactly what we will find, so tune in to the live feeds to see what we discover next! Hohonu Moana means "deep ocean" in the Hawaiian language. Learn to pronounce the expedition title here. Download a factsheet about the expedition. 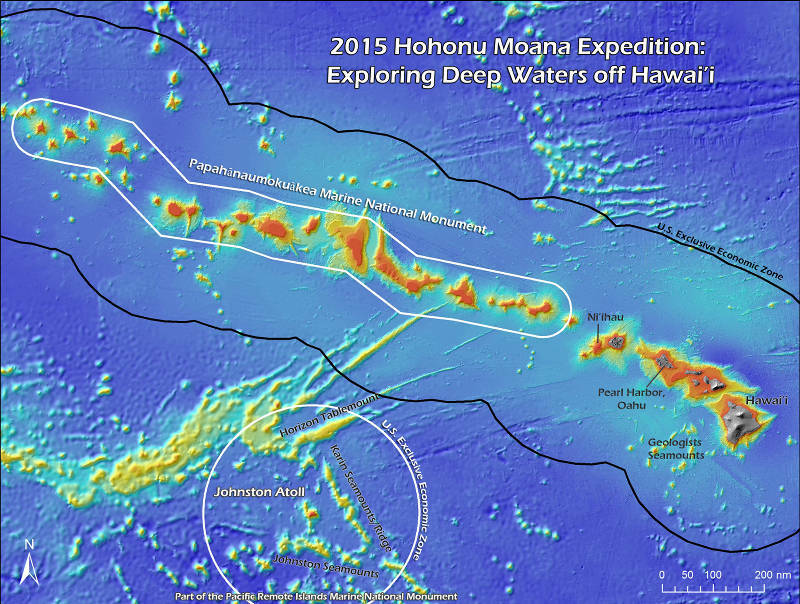 From July 10 to September 30, 2015, NOAA Ship Okeanos Explorer will explore largely unknown deep-sea ecosystems in the Hawaiian Archipelago and offshore Johnston Atoll as part of the Hohonu Moana: Exploring the Deep Waters off Hawai’i expedition. From July 10–July 24, 2015, scientists on NOAA Ship Okeanos Explorer conducted a 15-day exploratory mapping expedition focused on the Johnston Atoll region of the Pacific Remote Islands Marine National Monument. If you think of tropical Hawaii and corals, likely what immediately jumps to mind is snorkeling over gorgeous coral reefs teeming with colorful fish. But much deeper below the waves, beyond the depths at which sunlight-dependent reef-forming corals can grow, exists the hidden, perpetually dark world of deep-sea corals. Part the essential homework required for exploring any area is to review all of the mapping and diving that has already been done. Therefore, we are turning in our homework assignment in the form of a summary of the history of mapping and deep water diving that has been carried out in these two monuments. 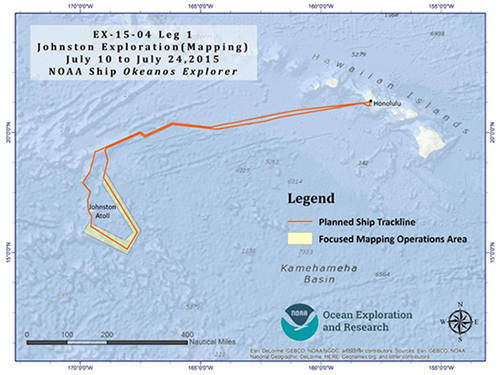 In the summer of 2015, NOAA Ship Okeanos Explorer will be conducting mapping and remotely operated vehicle operations in the two largest Monuments of the United States: the Papahānaumokuākea Marine National Monument and the Pacific Remote Islands Marine National Monument. 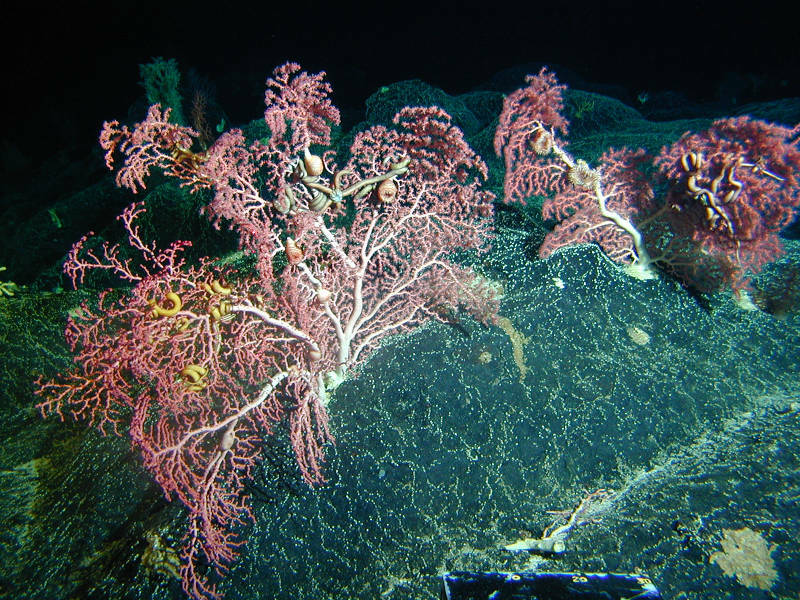 The deep seafloor, far from being a smooth muddy plain, is home to a large number of undersea mountains. 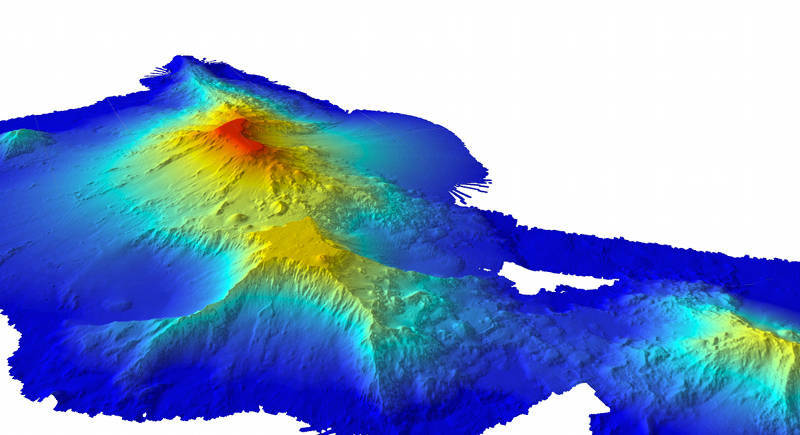 By definition seamounts are geological structures more than 1,000 meters high, but most are much taller than that, rising from the seafloor at about 5,000 meters depth to within a few hundred meters of the ocean surface. 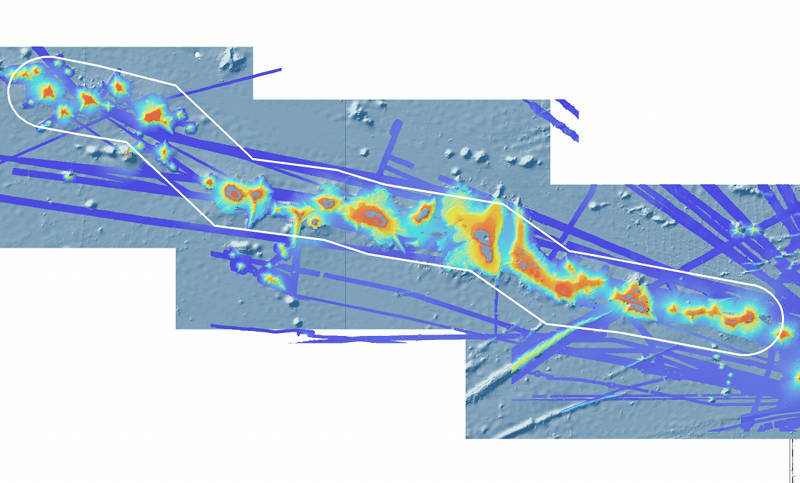 The Hawaiian and Johnston Island Exclusive Economic Zone seabed areas host significant deep-sea mineral deposits called ferromanganese crusts. These deposits are enriched in manganese, cobalt, and other metals of commercial interest, including rare earths.